Environmental laboratory productivity can be ‘significantly improved’ using the Rocket Synergy evaporator, says Genevac. Developed to quickly process large-volume environmental samples, in parallel and without supervision, Rocket Synergy can concentrate or dry 18 ASE tubes or up to six large-volume 450ml flasks. This enables the user to focus on other tasks, confident that the Rocket Synergy evaporator will achieve reproducible evaporation with excellent recovery rates. 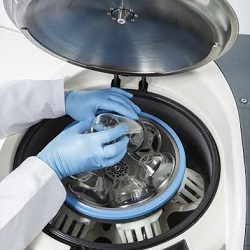 The evaporator enables samples to be concentrated directly into an autosampler or storage vial, eliminating the need for manual sample transfer. The evaporator uses low temperature drying to directly heat the sample flasks, enabling solvents to boil off by applying a vacuum. A two-stage cold trap provides high levels of solvent recovery, even with volatile organic solvents, it says.